The contract, their first contract, is the culmination of a five year fight. “It’s all changed now,” says Clem Papazian, a psychiatric social worker at Kaiser’s Oakland Medical Center, the elected President of NUHW’s Northern California mental health clinicians. “We are in a very different position with Kaiser than we’ve ever been before. Kaiser, based in Oakland, is the largest Health Maintenance Organization (HMO) in the country with 10 million members, 38 medical centers, 175,000 employees and 18,000 doctors. In 2014 the “non-profit” Kaiser Foundation Health Plan and Kaiser Foundations Hospitals reported $3 billion in net income and $60 billion in revenues. Today, its CEO, Bernard J. Tyson, receives compensation totaling perhaps $10 million annually, not including half a dozen pensions. Nevertheless, it had no way to replace the therapists, whose solidarity had, if anything, increased in the weeks before the threatened strike. A last minute Kaiser proposal for productivity quotas to be enforced with new disciplinary measures infuriated them. At the same time, Kaiser was losing the battle of public opinion. They relented and threw in the towel. It is five years now since these workers first entered negotiations for a contract with Kaiser. In 2010, in the aftermath of trusteeship by the Service Employees International Union (SEIU), 4000 California Kaiser workers decertified and joined the new NUHW. In these years, Kaiser stubbornly refused to bargain in anything approaching good faith. They demanded concessions in wages, benefits, staffing and work rules, well-knowing they would not be accepted. Meanwhile, Kaiser signed contracts with their ‘partnership’ unions (not very good ones) and with nurses – everyone but NUHW. They made it clear that SEIU’s California affiliate United Healthcare Workers-West (UHW), was their union. NUHW was outside the fold. Kaiser stonewalled their therapists demands on every front, above all on decent staffing ratios – this in a time of deepening mental health crisis – retaliating against critics and whistle blowers alike. They joined in a class action suit accusing Kaiser of breaking California’s laws regulating mental healthcare delivery. Kaiser was fined $4 million by state regulators. They worked for five years without a contract – no raises, no rights, no dues check-off – paying dues voluntarily directly to union representatives. They maintained a full-blown democratic union structure even as recognition was denied, indeed challenged on every front. 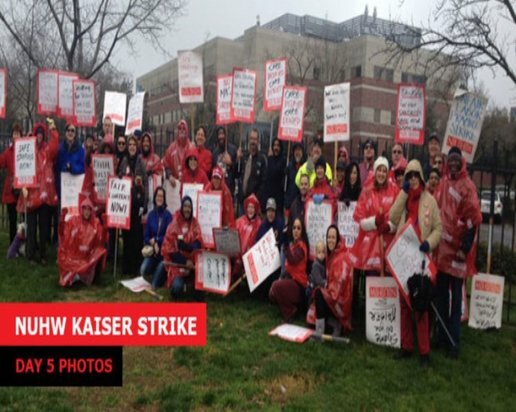 Finally, these Kaiser workers did this in the face of the SEIU’s pledge to “kill” the NUHW – to “drive a stake through its heart,” in the words of UHW President Dave Regan. SEIU members crossed their picket lines, SEIU organizers relentlessly pressed decertification drives. Indeed, Regan has stated publically, sometimes on the same platform with industry leaders, that there are no staffing issues at Kaiser. In the last days before the threatened strike, SEIU intervened with a fear campaign of its own – a specter of punishments, dismissals, takebacks. The issue of pensions was also central; Kaiser proposed – and still wants – defined benefit pension plans eliminated. It wants these switched over to individual 401K plans. That is, it wants to offload all responsibility for providing for the pensions of its workers. Certainly, Kaiser is not alone in this. Cutting pensions is today a central plank in the nation’s employers’ assault on workers: Caterpillar, Verizon, and Boeing have all won major victories here. All the more important, then, is the NUHW victory. According to Papazian, “Our strikes forced Kaiser to dial back. First they dropped the 401(K) plan, proposing instead two tiering it. No small accomplishment. Workers need decent pensions; all too often it’s a matter of survival. But again, it must be said, the NUHW clinicians did this in spite of opposition from SEIU. Papazian won’t say it, but this victory that saved the pensions of NUHW members has done much more; it has saved decent pensions also for tens of thousands of Kaiser workers, including the member of SEIU. According to NUHW Research Director Fred Seavey, “By my count, SEIU-UHW has eliminated defined benefit pensions for at least 20,000 of its members. “They did this at Dignity Health, which operates more than 30 hospitals across California and employs approximately 15,000 SEIU-UHW members. They also did so at the Daughters of Charity Health System where approximately 3,000 SEIU members work. Finally, they’ve made the same cuts at multiple stand-alone hospitals. In the last phase of this fight, Kaiser placed advertisements on BART, the Bay Area Rapid Transit, to the effect that mental health care was not the issue, that it was involved simply in a labor dispute with NUHW, nothing more – as if that relieved them of any moral responsibilities. NUHW President Sal Rosselli, says, “Kaiser doesn’t listen to their workers. They become healthcare workers because they want to help people. They join unions for the very same reason. The fight for decent health care delivery is a union issue – advocating for patients is what a union does, or should do. The tentative agreement is now in the hands of NUHW members. Bargaining continues in NUHW’s Southern California Kaiser units, where Kaiser has promised to settle similar contracts in short order. Clem Papazian believes, “This is just the start. We see ourselves at Kaiser as the tip of the spear in holding the whole industry to decent standards – of timely access for mental health patients and regulations that establish parity with medical health. Cal Winslow is the author of Labor’s Civil War in California (PM Press) and an editor of Rebel Rank and File, Labor Militancy and Revolt from Below During the Long 1970s (Verso). His latest book is E.P. Thompson and the Making of the New Left (Monthly Review). He can be reached at cwinslow@mcn.org.